Digital signage in retail is rapidly evolving, and the number of choices, from hardware to software, can be overwhelming. With rapid innovation, emerging technologies expand the possibilities for digital signage strategies in many different markets. So where do you begin? In this highly competitive environment, retail stores and chains are looking at ways to influence shopping behavior, create customer loyalty and develop metrics to measure success. Kiosks provide an ideal platform to enhance the customer’s shopping experience, provide the shopper an opportunity to interact on their terms and augment traditional in-store digital signage. Kiosks help retailers and retail brands increase sales through three key principles: attract, inform and engage. The biggest struggle retailers face is the ability to capture an interested audience and, more importantly, the right audience. Most consumers know exactly what they want and shop at specific stores based on their preference, the available product brands and the value that store brings. Using interactive kiosks, along with digital signage, retailers are able to draw the attention of consumers with stimulating, rich media content and visuals. The retailer’s main objective is to influence the consumer to make a purchase. However, brands found in retail stores can work with retailers and use kiosks to gain momentum over competing brands by generating awareness, engagement and incentive to purchase that brand. Let’s face it, while signage can provide a brand experience, consumers like to interact and engage when they are ready to buy. Kiosks make it easy to attract a consumer’s attention, encourage interaction and help guide a buying decision. Capturing consumer attention is only the first step. It is much more difficult to encourage action, such as a purchase decision. Kiosks have many capabilities to do just that. Through interaction with a kiosk, consumers are able to get targeted information on select products. Retail brands can use this information to guide, inform and influence a consumer to purchase their brand over a competing brand. This method delivers value for the retailer as well as the consumer. Many retailers are taking advantage of product promotion through demonstrations. For example, kiosks strategically installed adjacent to a product can stream a product video, encouraging consumers to stop and learn more. These types of informative videos are shorter in length and deliver a concise value proposition to capture consumer interest and encourage purchases. Kiosks enhance the customer experience, which can be attributed to increased sales. As discussed, the overall objective for kiosks is to help drive sales through relevant product information or guided purchase through a series of questions tailored to create a product selection based on the responses. Providing a valuable resource for the retailer, kiosks can also display up-sell or cross-sell advertisements and promotions for the selected product to help increase the average transaction value and sales conversions. An added benefit that kiosks offer retailers and brands is the opportunity to capture a consumer’s contact information for future engagement through newsletters or future promotions. Although different solutions may have different strategies, it is important to understand how to best transform the data captured into valuable insight and actionable permission-based information for future marketing campaigns. Tying analytics to kiosks helps to deliver valuable insight on consumer behaviors and shopping habits. Insights gleaned from analytics allow retailers to deliver tailored messaging to a target demographic or even a specific individual based on a profile of information. Interactive kiosks are able to determine the context and texture of the audience and provide relevant information based on demographics, pre-determined buyer personas and even permission-based individual profiles. Today kiosks can provide everything from basic product information, to guided selling and incentives to make a purchase like instant savings or other tangible benefits. 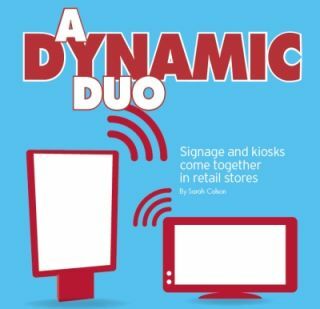 Forward-thinking organizations are starting to look at how location based or proximity marketing, social media and near field communications (NFC) technologies will be augmented into both signage and kiosks. In 2013 and beyond, expect to see NFC emerge as a standard feature in nearly all smart phones, allowing consumers an even deeper and more personal experience with store and product brands. These trends will further open mobile platforms for consumers who wish to engage and to retailers and brands to drive an even more personal conversation.